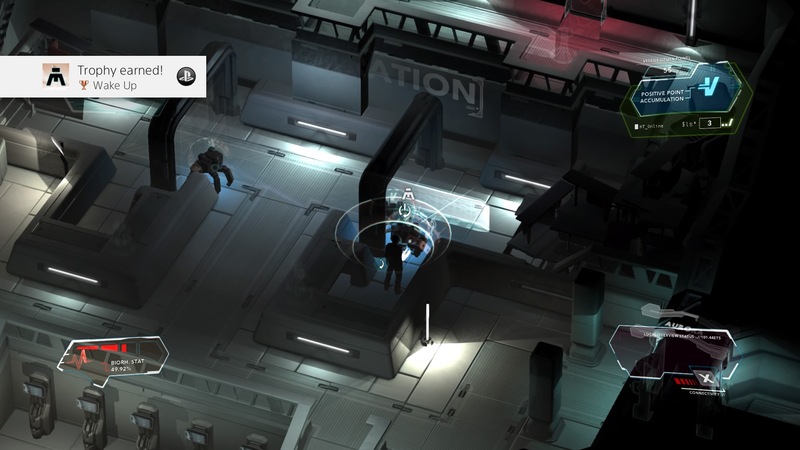 When I agreed to review Divide, all I knew about it was that it was a sci-fi adventure game. I like sci-fi. I like adventure games. Let’s check this baby out! Little did I know that while this game has the sci-fi down pat, it’s only part adventure game. The other part is top-down shooter, which really only works if it’s a dual-stick shooter. The Geometry Wars series and Super Stardust HD are really good examples of dual-stick shooters done well. Divide is the complete opposite of that. The biggest problem with Divide is that it is divided over what it wants to be. Is it a top-down shooter? Is it a point-and-click adventure? It tries to be both, but in the end, all of the ideas are executed rather half baked and poorly half-baked at that. The game sadly did not start off on the right foot with me when I learned in the first few seconds that the R2 is your main button for selection, execution, etc. That was already awkward from the get-go. Then you’re thrown into the middle of the story, where the player character named David and an NPC are trying to escape an evil headquarters of some sort. No real instruction is given for how to use any of David’s abilities or shoot a weapon, but you are in a fight with both robots and people. Once you realize that the game is going to send you back to the beginning, it’s easy to think, well, maybe that will be better once I learn how to use the controls. Yeah, not so much. I thought the controls for Heavy Rain were clunky and awkward, but I’ll take those any day over Divide. For starters, shooting a weapon should never require three buttons in play, unless you’re activating a special ability. Even then, when a game abuses that, such as the first inFamous game, it can grow tiresome. In this case, there’s no time for it to grow tiresome; it’s annoying from the get-go. To shoot your weapon, you must aim with the right analog stick, ready the weapon with L2, and then shoot with R2. All three must be in motion to shoot the main weapon at all. It’s as awkward and as unintuitive as it sounds. If that wasn’t bad enough, the game’s design hinders the shooting even further. When aiming, David can spin around a full 360 degrees, which makes it difficult to hold a steady aim. No matter how I adjusted the aiming sensitivity, it took an act of Congress for my aim to stay steady enough to maybe get off one shot. In addition, David’s weapon can only fire so many times before it has to rest and refill. When you first start playing, he can only take one shot. The robots take two shots to destroy. Imagine how much fun that is. The player must also take into account the elevation of David and his targets. For whatever reason, David can’t aim up or down while turning 360 degrees. If an enemy is higher or lower than you, you will not hit it no matter if your aim is dead on. Please note that enemies are not encumbered by the number of shots they can take or by their elevation. The right stick and R2 buttons are your main controls throughout, as R2 is how you select actions and options and the right stick allows David to use his lenses to see secret and hidden objects. If you’re running, you can’t use the lenses, and it takes time for the game to realize you aren’t running anymore to let you use the lenses again. If the game was a true point-and-click adventure, then the controls would still be clunky yet manageable, and the gameplay would be half as frustrating. The point-and-click elements are the best parts of the game. Adventuring through a world you don’t understand, solving puzzles, finding nuggets as to what is going on, these are as entertaining as a good adventure game should be. It’s a shame that combat bursts into the scene too frequently to jar you out of the experience and leave a bad taste in your mouth. You really don’t want to die and resurrect, because you lose a good portion of your weapon capacitors you have found as well as any hashes you have collected. This wouldn’t be such a big deal if you didn’t need certain numbers of hashes to progress through the adventure. If only Divide‘s story could limp this game into being okay, but it does not. It’s a very typical sci-fi tale that we see all too often. David’s wife has died in an accident at work, and years after her death, a colleague of hers tells David that it was no accident. He also hands him a briefcase that belonged to his wife and tells him to guard it. Instead, David opens it, puts on these magic lenses his wife created, and blacks out completely after finding some hidden messages she left for him in the house. When we wakes up, he’s in a basement of some facility and he has no idea where he is, how he got there, or what is going on. Oh, and he learns that the company his wife worked for was kind of evil and he’s been transported into the future to fix all of it. None of the characters are that interesting, and the accompanying bad voice acting only worsens it. I really didn’t care about a single character in the story; I just wanted it all to be over as much as David did. I honestly dislike coming down on a game, because I know the developers behind it usually put their hearts and souls into their finished product. Perhaps if they baked their ideas a bit longer, fine tuned the controls, and fixed some of the latency issues (especially with loading), Divide could have been the big sci-fi adventure they clearly aimed for. But as it is, I was only relieved it didn’t take too long to complete. Divide review code provided by publisher. For more information on scoring please see our Review Policy here.